In the middle of 1916 the French aircraft manufacturer SPAD delivered its latest fighter to the Western Front, the SPAD S.VII. This airplane matched its contemporary competition in every basic performance indicator, and in certain respects far exceeded their dogfighting capability. Soon the SPAD S.VII gained a reputation as a reliable combat machine, and its production under license began in Great Britain and also in Russia. Great interest in the type was shown by other allied nations: Italy, and the United States of America. When the United States entered WWI, it had no distinct, structured and properly equipped Air Force. An exception was a small number of volunteer pilots, who had enlisted in the French Air Force even before the USA came into the war, and were organized into a separate squadron, N.124 or the "Lafayette Escadrille", which over the course of a few months gained great fame, winning many outstanding victories in the skies of the Western Front. At first the pilots of the Lafayette Squadron went into battle with early version Nieuport fighters, but in the spring of 1917 they began to equip with the SPAD S.VII. With the increasing participation by the American Expeditionary Forces in the fighting in Europe at the beginning of 1918, it became clear that there was an urgent need for the Americans to have their own flying squadrons. The Lafayette Squadron SPA.124 was transferred to the newly formed United States Army Air Service with the agreement of the French Military and it was renamed the 103rd Pursuit Squadron. At that point the pilots had the chance to take the measure of the further development of the S.VII, the SPAD S. VII, the SPAD S. XIII but the new machine still required much modification, and that is why the S.VII continued as a "front line soldier" in the ranks of the United States Army Air Service. Additionally, in building up the equipment of the new Air Service the United States purchased 189 SPAD S.VII machines directly from the French government. They were passed to the newly created 138th and 638th Aero Squadrons, which formed part of the Fifth Pursuit Group at the end of 1918. The next 19 machines of this type were purchased from the government of Great Britain. They were almost at once sent back overseas, because it was intended that apart from buying fighters off the shelf, a license for their production would also be purchased; however, these plans were not realized. The standard American Liberty engine was too heavy for the slight SPAD S.VII, and the basic engine of the machine, the Hispano Suiza V8, was being produced in quantities which barely satisfied the heavy requirements of France and Great Britain.The machines which were delivered to the units of the U.S. Army Air Service were of standard fit although occasionally the pilots were permitted to exchange the regular Vickers machine gun with an American Marlin; however, such alterations were not commonplace. In the final months of the Great War the principal fighter of the United States Air Service was the SPAD S. XIII, which built on all the best features of the construction of its predecessor the SPAD S.VII. In spite of this, many SPAD S.VIIs remained on the complement of the front line squadrons until the end of the war, and afterwards the service of these machines lasted for a few years more, but in the territory of the United States of America. Roden's kit is very nicely molded and while there is a tad bit of flash from time to time, it is nothing major. The kit comes with a full cockpit (such as they were back then as well as a very nicely detailed machine gun. The SPAD was modified quite a bit during its short production run and Roden includes multiple engine cowlings and forward fuselage inserts as well as a couple of propellers. 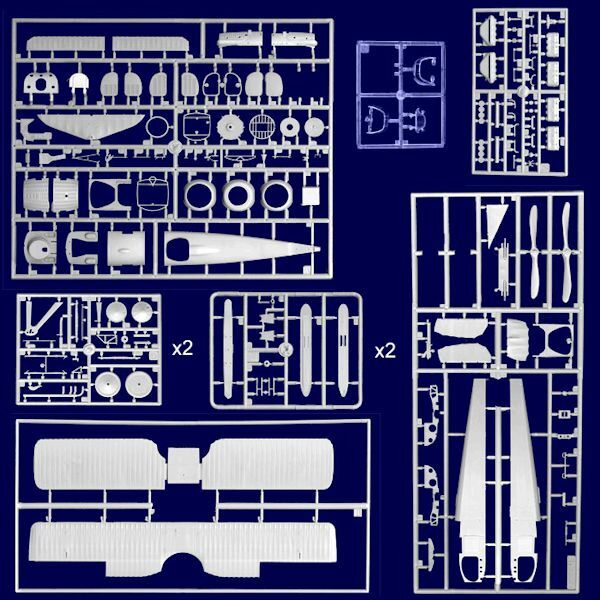 Naturally, not all of these are appropriate for this kit, but it definitely points to a lot of SPAD kits coming from Roden. 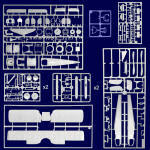 This particular kit has a pair of sprues to cover the skis (not skies) shown on the box art plane. Of course, there is no requirement to use these skis as the kit also comes with the standard wheels. As you can see from the parts layout (pinched from the Roden site), the kit has separate control surfaces as well, which is a nice touch as these planes did not have gust locks so the elevators were always dropped down. The kit includes markings for two planes. 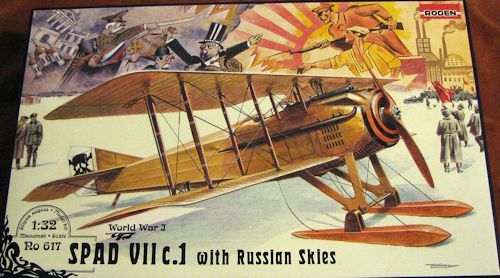 One is the box art aircraft of the Russian Imperial Air Service in 1917 as flown by Alexandr Kozakov of the 1st Battle air group. The other is one of the aircraft of the Finnish Air Force in 1923. Decals are very nicely printed, with no registration errors. The Finnish swastikas are separate so you'll need to add the other section to them. Many WWI modelers prefer the SPAD VII over the later XIII, thinking that it just looks better. Either way, you now have a nice big scale kit of this important WWI aircraft. I think you'll be seeing other boxing of it in the not too distant future. Roden web site for historical background. Thanks to Squadron Products for the preview kit. Get yours today atthis link.